Get inside or on top of Tank and Fire! 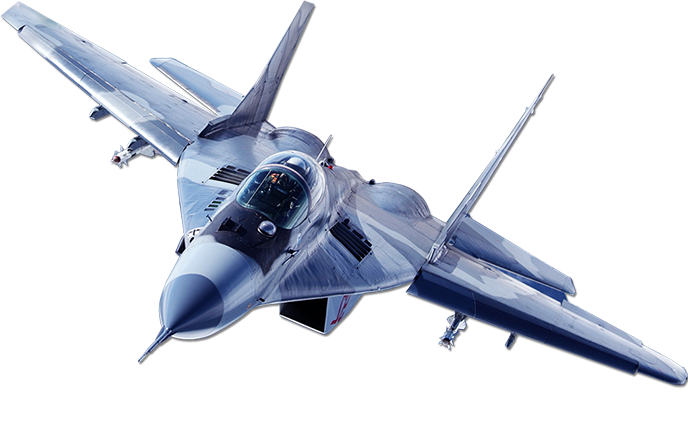 Fly Fighter Planes offers you with a vey unique adventure that is only possible in Russia. A dream for a fan of military machines, equipments, and war history, this tour is super fun and exciting. Visits to the museum are knowledgeable but are not as exciting as experiencing the real deal. One will not get to know the full capabilities and importance of an advance military mean machine during its service in a battlefield. This program not only allows you see these mean machines, but also touch, ride, hear, and smell it. Icing on the cake, you get to USE it by shooting from a tank gun! Our experts will keep you informed about the different models, their stealth capabilities, pros and cons and their tales from an actual battlefield. You will see the entire Soviet era collection of tanks right from First World War to present day beasts used by the Russian army. Important: Tank driving requires special skills and enhanced training. Tourists cannot drive tanks on their own. Professional tank crews do the driving, while you ride along. With the Tank tour, you can also try firing the main cannon, or the additional machine gun. Simulation of the explosion after a shot from the tank is also possible. However, for many customers, even that is not enough. To crush a car with the tank is the greatest pleasure for many. This is also possible upon request. Important: Only blank shells are used. One can also pair the tank rides with our top gun program where they can fire and test many Russian made guns and weapons. Please check the top gun Program in our website for more information! We can even organize a Military style on field buffet for you and your group. This is again an exclusive program arranged by us. 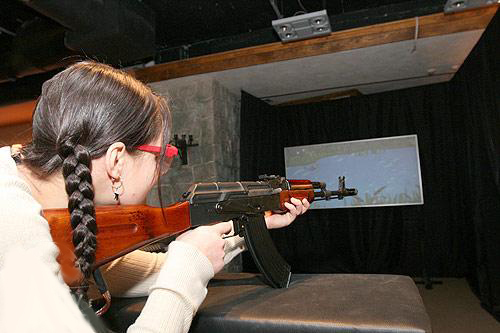 Top Gun program gives you an opportunity to try out the most modern Russian Arms - Handgun, rifle, shotgun - at an indoor shooting gallery. There is a wide choice of carbines, guns, pistols, with various targets that will allow you to develop and improve your shooting skills. 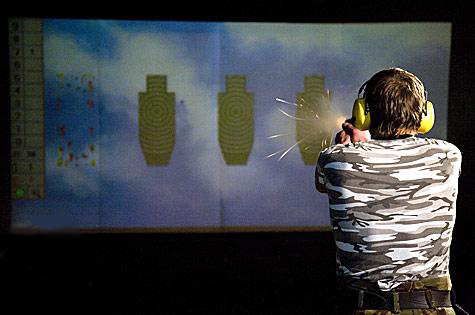 The shooting range is state of the art that allows a simulation of different theaters of operation with computer-controlled targets, allowing you to set your target at the exact distance you want to shoot. Skilled instructors will be present to guide you throughout the tour. One can even enjoy local Russian hospitality in one of the military bars between there shooting practice. It will be an adrenaline-filled, memorable experience. We guarantee that. This program lets you spend one unforgettable day on the base of a real field camp of Armed Forces of the Russian Federation, where Russian soldiers are deployed in summer time to hold military exercises, shooting, training for its specialists. It will get you acquainted with the life and daily routine of a soldier in the Russian Army. You’ll understand why Russian army is considered to be one of the toughest army in the world and have the opportunity to feel what real Russian soldier spirit means. Each of the participants of the tour will be trained by military experts and instructors in methods of combat training with weapon and unarmed. With the help of military specialists you will be able to get the skills to protect yourself during the radiation, chemical and biological attack, learn martial arts techniques, and protection against street attacks. 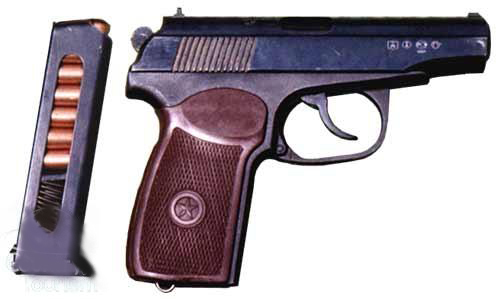 You will see the device core samples of firearms which are in operational service in Russia, assembly / disassembly of Russian firearms. And the most important thing - you will participate in an exciting war game of seizing a military base. It's a super program for the corporates for their team building and bonding exercise. A zone such as this will effortlessly engage the team to bring the best of their potential. With tanks, super-sonic jets and military environment, the hero inside any person would show up. Please see our MICE programs to read more about corporate programs. This tour gives you a chance to board a real Russian submarine – B-396 and to discover true stories of heroism and experience life under the sea through the personal belongings of the crew. This diesel Submarine was built in Nizhniy Novgorod and served in the North Fleet between 1980 and 2000. We will take you to the torpedo section where you will see six torpedo tubes and the crew’s diving suits. We will move to the accommodation section by walking through the control room where you can learn how to navigate. The design of the accommodation section is very simple with only necessities. Even a submarine captain sleeps in very small cabin. The museum guide will tell you about the unique and critical role of Russian submarines in a peace-keeping mission. The museum is located in the south-west part of Moscow on the bank of the Moscow River. The tour takes approximately 30 – 40 minutes.